The Royal Mint has revealed its London 2012 50p commemorative coins are proving more popular than any other UK circulating coin since decimalisation in 1971. Since their release into general circulation in October 2010, The Royal Mint anticipates that more than £10 million worth, or over 70% of the coins, will be kept by people looking for a ‘free’ souvenir of London 2012. This is a huge increase on the standard loss of 2% to 3% on most other new circulating 50p coins which are removed by collectors or simply lost. The Royal Mint has said it’s not unusual for special commemorative coins to be removed from circulation in this way but that the London 2012 coins would break all previous records. Struck at the organisation’s headquarters in South Wales, the coins were designed by members of the public as part of a Royal Mint competition in which nearly 30,000 entries were submitted. They are the first ever UK coins to be designed by the public. 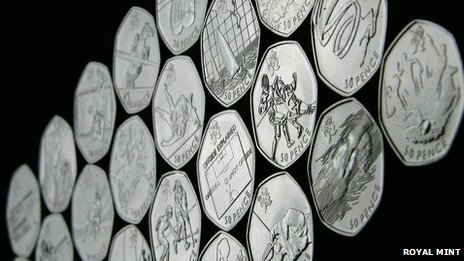 Each of the twenty-nine 50p coins features an Olympic or Paralympic sport on its reverse. These include sailing, cycling and basketball as well as less well-known sports such as handball and the Paralympic sport boccia. The 50p coins are seen as a perfect souvenir to remember London 2012 due to their intrinsic value and quality which holds an interest and fascination for generations to come.